Nowadays people prefer using instant messaging apps, most of which are free and have more advantages than the traditional SMS. Among iOS users, iMessage is the popular one. When you enjoy using iMessage with friends, have you prepared for accidents of data loss? Do you know how to get back iMessages if you accidentally deleted or lost them? Don’t be panic. Here are four ways to recover deleted iMessages on iPhone or iPad. Method 4: Get Back iMessages from Other Apple Devices. Step 1: Run the software and Select “Messages” and “Messages Attachments”. Step 2: Connect iPhone to computer, and then click Next to scan. 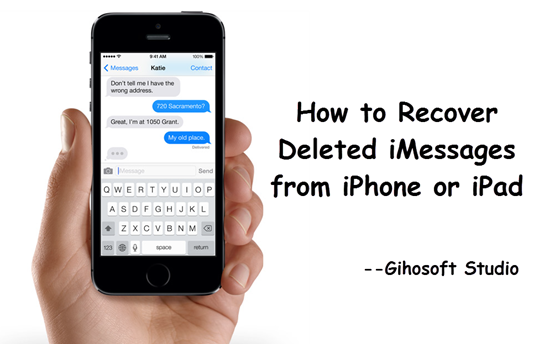 Step 3: After scanning, retrieve deleted iMessages on iPhone. If you sync iPhone with iTunes regularly, your iTunes backup might contain the iMessages you need. However, iTunes backup is encrypted even for its users. Hence you can restore iPhone directly from iTunes, or you can use the Gihosoft iPhone Recovery software to extract iMessages from iTunes backup only. Step 1: Open the iPhone iMessage Recovery tool and select items related to messages. Step 2: Choose “View iTunes Backup” and select one to scan. 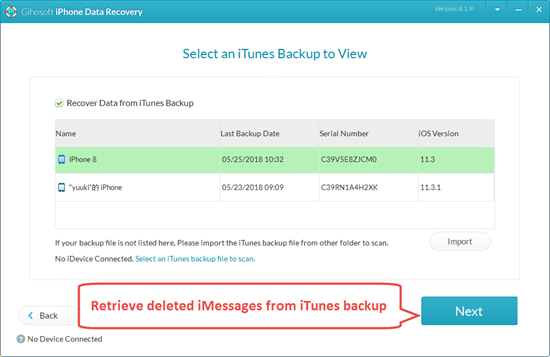 Step 3: Recover deleted iMessages from iPhone backup after scanning. Beside iTunes, iCloud also is a good way to back up iPhone in time of need. If you’ve scheduled iCloud backup, it will automatically sync your iOS device regularly while connecting to network. 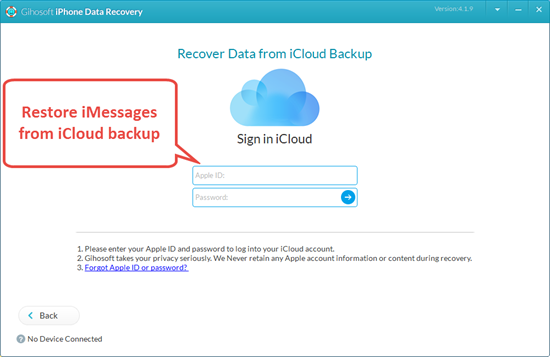 Hence whenever you lost any data, you can erase your iPhone to restore iCloud backup, or you can follow these steps to only recover iMessages from iCloud with the Gihosoft iPhone Recovery software. Step 1: Run the iPhone Text Recovery and tick Messages related items. Step 2: Click on “View iCloud Backup” and sign in with Apple ID. 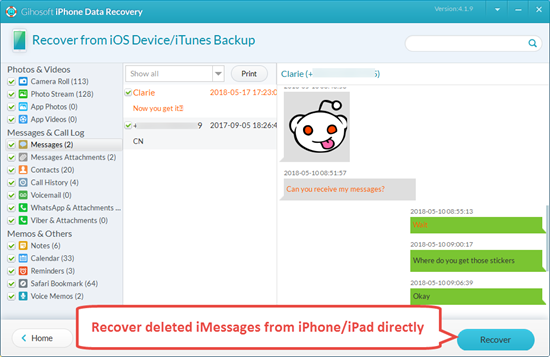 Step 3: After scanning done, recover iMessages from iCloud. If you have a Mac or other iOS devices, and have iMessages sync among these, probably you can get back iMessages from them. In iOS 11.4 Apple officially enabled messages in iCloud, which means it will sync all your messages and threads among your iCloud device, as well as your deletion. But if you haven’t updated yet, you may get back deleted texts from another iDevice. And if you have a Mac with Time Machine enabled, you can restore deleted threads from Time Machine backup.